Babylonian amora; flourished in the second half of the third century. He was a contemporary of Ze'era (Yer. Suk. iv. 54b; Ḥul. 62a et seq.). He is cited in the Palestinian as well as in the Babylonian Talmud by some of the foremost teachers of his generation (Yer. Shab. iii. 5c; Yer. 'Er. i. 19d, ii. 20a; M. Ḳ. 8b, 12a; Ḥag. 8b; Ket. 97a; B. Ḳ. 97a; B. M. 64b), but generally as the transmitter of Halakot he had learned from his predecessors. That he was regarded as a saint appears from the legend relating that he would daily inspect his garden and mark the beds requiring water, whereupon rain would descend and moisten the beds thus marked (Ta'an. 9b; Yalḳ., Zech. 578). 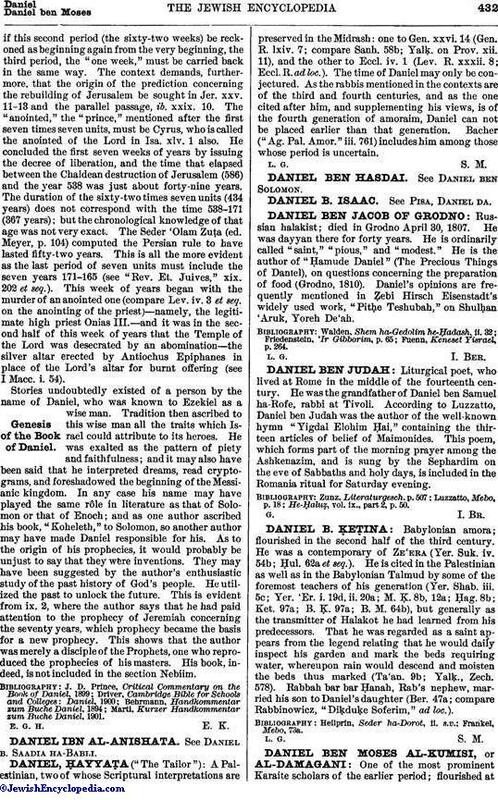 Rabbah bar bar Ḥanah, Rab's nephew, married his son to Daniel's daughter (Ber. 47a; compare Rabbinowicz, "Diḳduḳe Soferim," ad loc. ).